Music Costs > How Much Does a French Horn Cost? How Much Does a French Horn Cost? The French horn is said to be the leader of the brass instruments. This musical instrument that we know as the French horn was first developed in Germany; it was only completed in France. Ironically, it is only in the English language that this instrument is called the “French horn.” Other countries, such as those in France, Germany, Spain and Italy, simply call it a horn. On average, a new French horn can retail for anywhere from $1,000 to as much as $7,000+; however, there are customized French horns that can get very close to the $10,000 to $15,000 price tag. The cost of a French horn will depend on the condition, brand and where it’s purchased. A student horn, for instance, will be much cheaper than a name branded triple horn. A used French horn, from the prices we saw on eBay, could be up to 70 percent less than this. Musician’s Friend, a popular online music retailer, has a wide selection of French horns, with prices ranging from $1,600 for a double horn to as much as $9,000 for a triple horn. According to Colin Dorman, the costs can be quite large, ranging from $200 to more than $18,000. If you’re looking for a double horn, he recommends setting a budget no lower than $3,500, but the higher the better. If you’re interested in a used horn, on the other hand, then he recommends setting a budget at $1,500; again, the higher the budget, the better. French horns will have a corresponding standard mouthpiece from the manufacturer, and in some cases, it may also come with a carrying case. Most of your name brands, as noted in the table above, will come with a manufacturer warranty. A French horn can either come as a single horn, a double horn or even the triple horn. A single horn will come with two keys: F and Bb. It will also come with three rotary valves. A single horn is easily identified because it has three valves. A double horn, on the other hand, is able to shift between the key of F and Bb through the fourth valve. 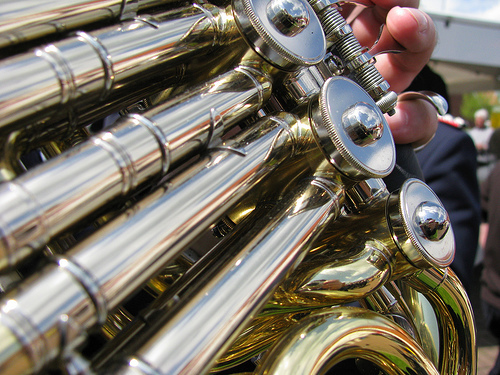 The French horn has five parts: the body, valve system, bell, mouth pipe, and mouthpiece. In terms of materials, a French horn can be made from either a yellow brass, rose brass or nickel silver. Yellow brass is the most common material that’s able to create a dark sound. Rose brass will be a bit softer, and the sound, when compared to yellow brass, will be darker. Lastly, nickel silver, even though it says “silver,” doesn’t actually contain silver since it’s formed from nickel. It’s a very hard material and can create a very bright sound. One term you will see on the market is “bore.” The bore referes to the cylindrical tubing, which is generally between .468 and .472 inch. French horn accessories can be purchased separately such as a carrying hard case ($100~), polishing cloth ($25) and/or a pair of gloves ($10) needs to be considered. To learn the instrument, you may want to factor in potential lesson costs. Always, no matter where you purchase your horn, try it out first. A reputable online retailer will always allow you to try it out for a week or so before you have to commit to your purchase. Since all horns aren’t created equally, it’s important to find a French horn that you’re comfortable with. When trying it out, try it out in as many environments as possible to see how the sound sounds from far away. It is important to keep your French horn’s rotor valve properly oiled to make it fast and efficient. Also, because the horn is played by blowing air into the mouthpiece and through the mouth pipe, these parts will become filled with spit; they need to be cleaned out after every performance. There are special tools made for this purpose to make it quick and easy to do. According to Wikipedia, there are seven important things you need to do in order to become a good French horn player: “the seven most important things include pressing the valves, holding the appropriate amount of lip tension, raising the soft palate, positioning the tongue, lowering the larynx, blowing air into the instrument, and placing the hand in the bell. With so many music retailers, compare prices with at least three to five retailers before making a decision. Be on the lookout for special coupon codes, sales or even check the clearance section if they have one. Don’t be too cheap with your horn, however. Cheaper horns often come with questionable quality control with cheaply made parts, creating for a poor sounding instrument. You may want to consider a second hand French horn by browsing Craigslist or eBay. In fact, some people state that a used horn can actually play better since it’s broken in and will be much more responsible. As long as it’s well maintained once purchased, it can last just as long as a newer instrument. If you’re unsure you want to invest thousands, highly consider renting one for as little as $20 to $60 per month. Talk with a local music store to see if they have any options available.